Sometimes I just can’t be bothered to do the ‘best’ thing. 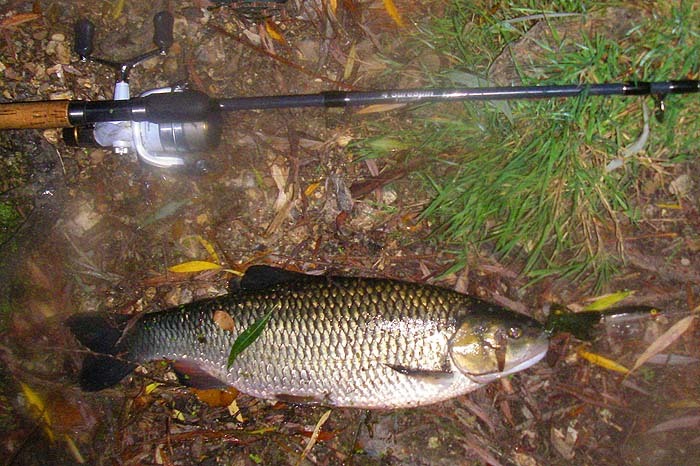 I’d been thinking about trying a spot more live baiting for chub and perch but what with fiddling about catching and carrying baits and carting along an extra rod for bait-fishing I (lazily) opted for a spot of spinning. However, just to try something a bit different I thought I’d give an early morning session a go. Of course I can usually catch plenty of fish during the hours of daylight and I generally reserve my dawn fishing for the bass but I raked myself out of bed at 05.00 hrs and drove over to the river. I was using a J11 floating Rapala which fishes nice and shallow. I thought it was likely that, in the gloom, the chub would probably be in shallow water so I began operations in the tail of a big pool. The river is very low at the moment so there was probably not much more than a foot of water over the gravel. The third cast produced a good bite and the fish pulled pretty hard. Pike! I thought, but after a minute or so I saw the big, rounded dorsal fin of a fine chub. I landed the fish and took a couple of pictures before returning it to swim off strongly. Disappointingly, another fifteen minutes of plugging produced no more bites so, as the light improved, I decided to go to a stretch that I haven’t fished for years. Back to the car and a short drive upstream and I was in action again. For some reason (that’s not clear to me – even though I did it) I decided to try a smaller lure, so instead of the black and silver J11 I tied on a little J7 with a blue back. I still had a short trace of 15lb knotable wire and the 20lb braid that I’m using at the moment (so thin, smooth and soft it isn’t true) so the lure cast almost as well as its larger sibling. The first place I tried was a set of shallows not much more than ankle deep. From a little pool close to the right hand bank I caught a small perch then a little further up a small chub. Then a cast into the fast water produced a trout of about a pound. By now I’m beginning to wonder whether switching to a smaller lure was a good idea. Was it tempting smaller fish? No more bites from the riffle so I walked down to a small weir and cast downstream into the race. 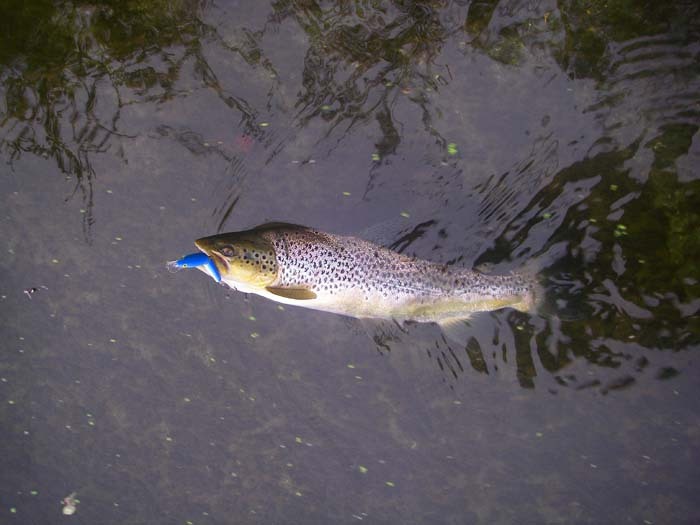 Wallop – a nice trout took the plug and leapt clear of the water. It took me a while to play and land this one because it had to be maneuvered up the face of the concrete weir. I took its picture and released it – excellent. Climbing out onto the grassy bank I walked upstream through the fields for a couple of hundred meters. The first two casts produced tiny perch so I moved up a bit further to where the water was deeper (perhaps a couple of meters), very slow flowing and dark with a bed of silt and filamentous algae. I cast across to the far bank and began to retrieve thinking that the little balsa plug might not be fishing deep enough. No need to worry. 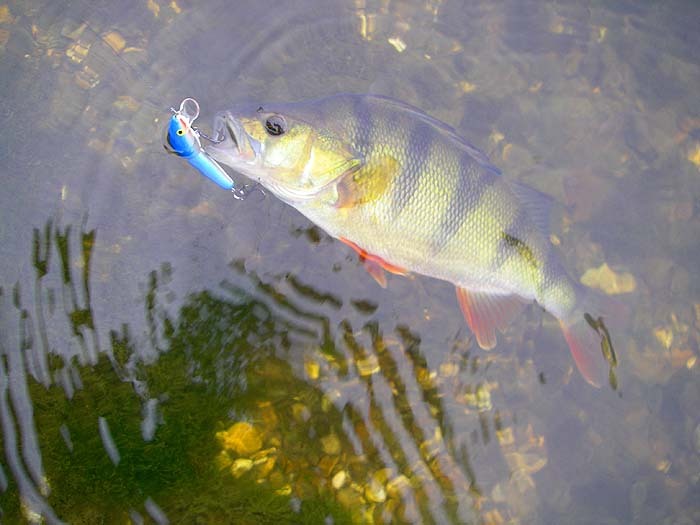 a decent perch hooked itself and jagged about on the line as I played it to my feet. Excellent! Another couple of casts into the deeper water and suddenly there was a fierce take. Pike! I thought but the tugging fight was not pike behaviour. It was a couple of minutes before a big, black looking perch, well over two pounds, hove into view. Result! That was my last fish of the session but I certainly couldn’t complain.